A new sensor called the SEC 3000 can detect dangerous levels of tungsten hexafluoride – WF6 – has been developed by Sensor Electronics of Minneapolis. The highly toxic gas is widely used on semiconductor lines, electronics production, R&D laboratories and similar applications. The factory-tuned unit gives immediate real-time readout of tungsten hexafluoride levels over a 0-10 PPM range. The stand-alone sensor can work by itself, tie into an existing alarm network, or work with its own dedicated transmitter that shows actual WF6 levels on a digital readout panel. The transmitter has LEDs that change from green to amber to red as WF6 levels increase. At red, integral relays can turn on alarms, and start emergency fans to flood the area with outside air. The SEC 3000 gas detector was designed to ward off harsh conditions involving temperature, pressure or humidity extremes. In addition, a display on the transmitter shows accurate readings of what is happening real time. For optimum installation flexibility, sensor and transmitter can be up to 500 feet apart. Along with WF6, sensors are available to sense a wide range of toxic gases used in semiconductor production such as dichlorosilane (DCS), boron trifluoride (BF3), silicon tetrafluoride (SiF4), sulfur hexafluoride (SF6). 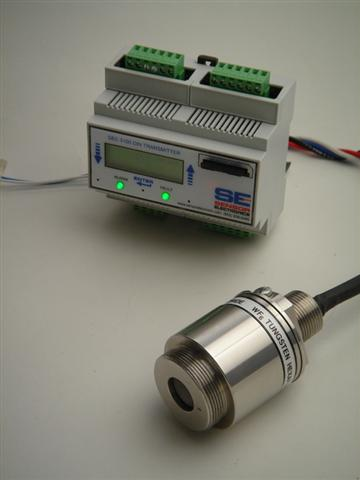 The cylindrical sensor measure 2 inches diameter, 3.5 inches long. Stainless-steel construction ignores corrosive atmospheres. Additional information about this new WF6 sensor is available from Sensor Electronics, 5500 Lincoln Drive, Minneapolis, Minnesota 55436.